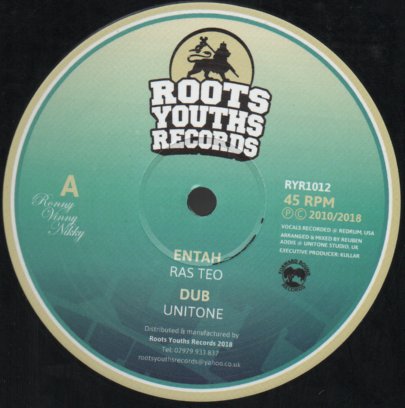 Ras Teo - Entah / dub / Tallawah / dub (Roots Youths) UK 12"
Delighted to see the return of this anthemic UK roots piece courtesy of Roots Youths Records. This record secured legendary status via the medium of Channel One Sound System for the past 10-15 years. Ras Teo's soulful vocal in tandem with the uplifting march emanating from Unitone production stable make this one a classic. There are very limited copies available so grab them while you can.